New. Trade paperback (US). Glued binding. 142 p. Contains: Illustrations, black & white. In Stock. 100% Money Back Guarantee. Brand New, Perfect Condition, allow 4-14 business days for standard shipping. To Alaska, Hawaii, U.S. protectorate, P.O. box, and APO/FPO addresses allow 4-28 business days for Standard shipping. No expedited shipping. All orders placed with expedited shipping will be cancelled. Over 3, 000, 000 happy customers. Fine. Trade paperback (US). Glued binding. 142 p. Contains: Illustrations, black & white. In Stock. 100% Money Back Guarantee. Brand New, Perfect Condition, allow 4-14 business days for standard shipping. To Alaska, Hawaii, U.S. protectorate, P.O. box, and APO/FPO addresses allow 4-28 business days for Standard shipping. No expedited shipping. All orders placed with expedited shipping will be cancelled. Over 3, 000, 000 happy customers. New. 1946920568 Special order direct from the distributor. 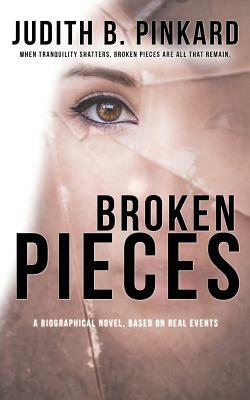 Broken Pieces was an emotional four star read. This is my first read by Judith B. Pinkard and her debut as well. This is a heartbreaking biographical novel. This is a story that really makes you think about life choices. Helen and Ernest are in a life altering accident with there friends and baby Judy. This is where Helen's life spiraled out of control with addiction and coping. We all have a story to tell, and we all suffer in various ways. However, the ability to use pain to help others is our duty-a transcendent obligation. Judy's story was familiar in some ways that I could relate slightly. There were other times my heart went out to her. There are some shocking twist and turns. It took a lot of courage to write this story and I hope it also gave some peace to Judith as well.This is not my normal genre to read but I really enjoyed reading Judith's story. Thank you!